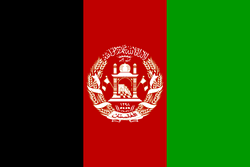 The Afghanistan flag has had more changes of its national flag during the 20th century than any other country in the world! The current flag was adopted in 2004. This colorful flag measures 3' by 5' and is printed on lightweight polyester, perfect for indoor display. The flag also have bronze colored grommets for easy hanging.